Maurice Mendelson is a practising barrister (Queen's Counsel) at Blackstone Chambers, London, specializing in public international law. He has represented and advised numerous governments, inter-governmental organizations, non-governmental organizations, multinational and uni-national corporations, and individuals. His work involves litigation (e.g. in the International Court of Justice, European Court of Justice, European Court of Human Rights, international arbitral tribunals and national courts); transactions (e.g. inter-State negotiations and advising on contracts between States and corporations); advice; and expert evidence in foreign courts and international tribunals. He is a recognized authority on the sources of international law and has practised extensively in most areas of the subject including the law of the sea, boundaries, investment protection, the relation between international and national law (including immunities), international adjudication and arbitration, international organizations, and human rights. 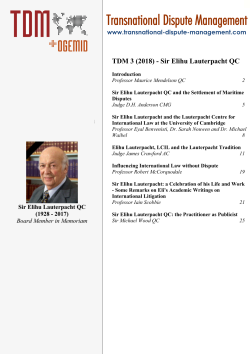 He has been in practice since 1971; until 2001 he also held the Chair of International Law at University College, London University, from which he took early retirement in order to concentrate on his practice. Amongst other honours, he has been elected a Bencher of Lincoln's Inn, a member of the American Law Institute, and appointed an Officer of the Ordre de la Valeur of Cameroon. The author of numerous articles on many different aspects of public international law, he is currently writing a book on the subject. He is Consultant Moderator for TDM's sister electronic publication, OGEMID. Maurice Mendelson QC, Consultant Moderator for TDM's sister electronic publication, OGEMID, prepared this TDM Special Issue. For subscribers the chapters are available as individual papers, see the table of contents here. All others may download the combined papers as a free download below.